Mercedes-Benz has revealed its refreshed GLA subcompact crossover ahead of this year’s Detroit Motor Show. First introduced in 2013, the GLA helped define the tiny utility vehicle segment with what amounts to a lift kit on an A-Class hatchback. In the U.S., the GLA is the only way we kinda sorta get the A-Class, as Mercedes-Benz prefers to sell us the CLA subcompact sedan. No one’s really complaining though — the GLA is quirky and the automotive world always needs more of that. For the 2018 model year, Mercedes focused on exterior and interior tweaks to keep the GLA appealing among a broadening group of competitors. Redesigned front and rear bumpers, new standard and optional wheel designs, the addition of Canyon Beige paint, and full LED headlights round out the exterior modifications. Inside, an 8.0-inch center display and rearview camera are standard, the instrument cluster has been updated, Android Auto has been added, and a new Black Ash wood trim replaces Burl Walnut. As for the GLA45 AMG, the same 2.0-liter turbocharged four-cylinder engine pumps out more power than any other 2.0-liter turbo on the market: 375 horsepower and 350 pound-feet of torque. A seven-speed dual-clutch transmission transfers grunt to all four wheels for a blistering 0 to 60 mph spring of 4.3 seconds. The 2018 GLA45 and CLA45 AMG cars are now available with an AMG Performance Studio Package (a.k.a “Yellow Night”). 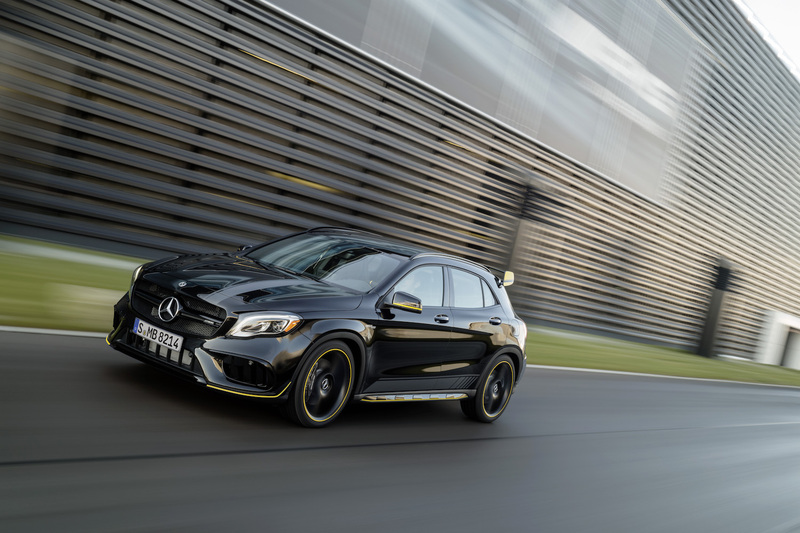 Included in the special edition is matte graphite gray paint with yellow accents, AMG sport seats with microfiber inserts and yellow trim, unique sill plates and floor mats, and AMG’s performance steering wheel. Nothing says sporty like neon yellow accents. Pricing for the Yellow Night edition and all other 2018 Mercedes-Benz GLA models will be revealed closer to their on-sale date this summer.